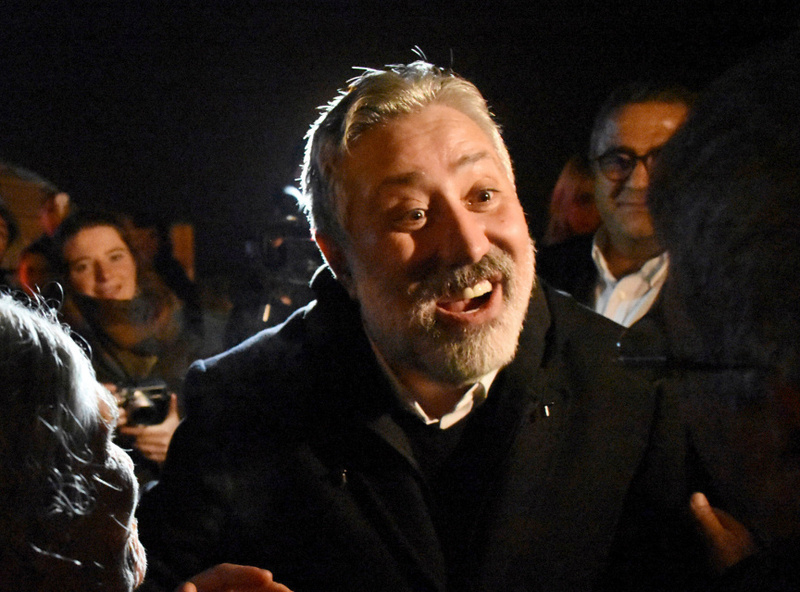 ISTANBUL (AP) — A Turkish court on Wednesday convicted journalists and other senior staff members from the opposition Cumhuriyet newspaper on terror charges, in a case that has exacerbated concerns over press freedom. Turkey's official Anadolu news agency said that 14 employees were found guilty of "aiding a terror group without being a member." They were handed sentences ranging from 2½ to 7½ years. It wasn't immediately clear if they would spend further time in jail and all are banned from leaving the country. Three people were acquitted. The newspaper said those convicted include editor-in-chief Murat Sabuncu, leading journalists and columnists, as well as a cartoonist. Outside the courthouse, Sabuncu called the verdict an "attack" on journalists aimed to "stop us from doing journalism in Turkey, to make us fearful when we're doing journalism in Turkey." He said they would continue their work even if they have to go back to prison. A total of 19 Cumhuriyet staff members were accused of "sponsoring terror organizations," including Kurdish militants, a far-left group and the network of U.S.-based Muslim cleric Fethullah Gulen, whom President Recep Tayyip Erdogan's government blames for a failed coup in July 2016. Gulen denies involvement. The court convicted Akin Atalay, the board chairman, but ordered him released from prison. Eleven others were released earlier in the trial after having spent months in jail. Five staff members were tried without being imprisoned. The prosecutions of two defendants who are not in Turkey, including former chief editor Can Dundar, were separated from this case. A man suspected of using a Twitter handle critical of the government was also on trial along with the Cumhuriyet staff. Kemal Aydogdu was sentenced to 10 years for terror group membership and will remain in custody. Authorities arrested tens of thousands on terror charges and dismissed more than 110,000 from government jobs in a massive crackdown that followed the coup. More than 38,000 remain behind bars on alleged links to Gulen. Journalists, opposition lawmakers and activists have been imprisoned. Prominent investigative journalist Ahmet Sik tweeted after his guilty verdict, alluding to Erdogan: "No dictator in history ever won the war to silence the righteous. We will win." Kadri Gursel, an influential columnist, said "the case against journalism would go down in history" in his final defense to the court earlier Wednesday. The journalists were put on trial on the outskirts of Istanbul within the compound of a maximum-security prison. Turkey ranked 157 out of 180 countries in Reporters Without Borders' 2018 index on press freedom.